John Spears' article in the Toronto Star today throws around some figures on the 2100MW Lennox Generating Station. While the cancellation of gas-fired power plants in Oakville and Mississauga grab headlines, a much older gas plant labours in obscurity in eastern Ontario. At least, it labours from time to time. Factoring in the regular payments based on its capacity, it has received about 26.5 cents a kilowatt hour for its electricity over the past five years. That’s close to triple what most gas-fired plants get for their output, and more than double the price paid for power from wind turbines. Spears article contains a lot of information, but I think misses the fairest comparisons and the bigger issue. Reserve margins are required by the North American Electric Reliability Corporation (NERC) - Ontario's system operates within NERC's standards. Spears compares the cost of the firm capacity, or capability, from Lennox to wind output - which lacks any capability to meet demand as required (see Table 4.1 here). If the market was required to take all the output Lennox could produce, the cost would be much lower (and fuel use, and emissions, much higher). The comparison would be to alternative options for capacity. The most likely comparison for that what be the less efficient York Energy Centre, which I would guess has a Net Revenue Requirement of 12,900 (based on the revealed originally contracted NRR of the Greenfield south OCGT plant). The 393 MW capacity York has produced about 106GWh over the past year; putting it at ~3% of capacity at a average cost of 62.4 cents a kilowatt hour (assuming the cost recovered in the market just paid for the fuel). That makes Lennox a pretty good deal for firm capability. The bigger question is what necessitates procuring capacity outside of the market pricing for electricity. The effort not to connect these stories will be far greater than my effort in posting them. The UK's emissions of climate-warming gases surged in 2012 as cheapcoal replaced gas in power stations, official data revealed on Thursday. However, 2012 was a record year for renewable energy in Scotland, which produced enough electricity to power all of its homes. The Working Group on Energy Balances (AGEB) has recently published a detailed report regarding the energy consumption in 2012 in Germany. 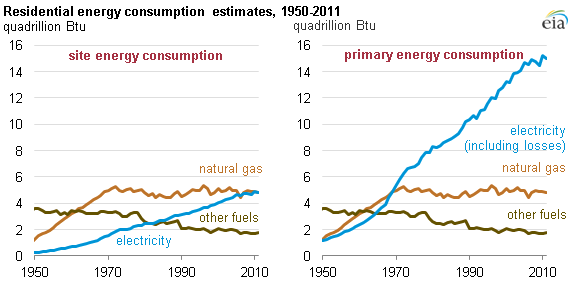 Primary energy consumption increased by 0.9%, while overall economic growth was 0.7%. A nuclear energy-free future for the UK is not something the coalition "is thinking seriously about", the government's chief science adviser said on Tuesday at the launch of the country's long-term nuclear strategy. The government said its nuclear strategy would help seize the economic opportunities of a £1 trillion global market and provide 40,000 UK jobs. Prof Sir John Beddington, the government's chief scientific adviser, said new nuclear power was essential: "We really can't see a future for the UK energy sector, if we are to meet our climate change obligations and have resilience in the power sector, without a significant component of nuclear. A non-nuclear scenario is not one the government is thinking seriously about." Beddington led a review of the nuclear research and development programme needed if the government's high-nuclear scenario for future energy is to be feasible. Prof David Mackay, chief scientific adviser at the department of energy and climate change, said this scenario – one of fourset out in the 2011 carbon plan – envisaged 75GW of nuclear capacity in 2050 providing 86% of the UK's electricity, a situation he compared to France today. Thunder Bay is home to the only coal-fired generating station in Ontario not currently slated to be closed by the end of 2013. There have been moves towards converting the plant to operate on natural gas, but the latest moves towards that were halted some months ago. The Chronicle-Journal "The Newspaper of the Northwest" reports that local politicians are, predictably, taking an IMBY (in my backyard) stance toward keeping it's infrequently utilized local generating station. The city has maintained that converting the plant is the only way to provide enough reliable power for the region, especially considering what many say is a looming mining industry boom. The announcement that the U.K. will be getting natural gas from the U.S. is the latest indication that North America will cease to be a captive island for it's natural gas supply - and therefore a harbinger of pricing in North America moving towards world pricing levels. Nearly 2m homes in the UK will be heated by shale gas from the US within five years, under a deal agreed on Monday that is likely to be the first time major exports of the controversial energy source are used in the UK. The US government has kept a tight rein on exports since the shale gas boom started more than five years ago. But the deal struck by energy company Centrica marks the start of a new era in gas use in the UK, because it opens up the market to cheap supplies from the US, as North Sea gas fields run out and pipelines to Europe remain expensive. Shale gas exploitation has been blamed for environmental problems in the US, including water, ground and air pollution and leaks of methane. Under the deal, Centrica will pay £10bn over 20 years for 89bn cubic feet of gas annually – enough to heat 1.8m homes – from Cheniere, one of the first US companies to receive clearance from the federal government to export shale gas in the form of LNG (liquefied natural gas). The first deliveries, by tanker, are expected in 2018. The Financial Times (subscription) has details on this deal, and information on other deals. The Development Bank of Latin America has issued its first loan for a nuclear project to support the refurbishment and licence extension of Argentina's Embalse nuclear power plant. The loan was announced on 19 March by the president of the bank, Enrique Garcia, and the Argentinean minister of planning, public investment and services, Julio De Vido. Amounting to $240 million, it will help Nucleoelectrica Argentina SA (NA-SA) in refurbishing the Candu pressurized heavy-water reactor at Embalse. This means replacing the pressure tubes, installing new steam generators, new control systems and increasing its power output by 35 MWe to around 635 MWe net in the process. The work could begin this November. The Toronto Star had an article reporting on Nextera's battles with local jurisdictions. For reasons I note below, a reference to Nextera often leads me to check on the status of MESA Power's Chapter 11 NAFTA challenge. The case had been dormant but I found it has come back to life as of late (of 9 active Chapter 11 challenges, 2 are due to the Ontario government's feed-in tariff adventure). 24. The domestic content requirements in the FIT program caused Mesa Power to modify its own purchasing decision with suppliers. Mesa Power diverted purchases from preferred suppliers outside of Ontario and instead negotiated agreements with goods and services suppliers in Ontario to comply with the FIT Program requirements. The imposition of the minimum domestic content requirement resulted in an increase in cost to Mesa Power of over US $100 million for its projects in Ontario. As austerity measures take hold from Spain to the Netherlands, governments have been rushing to cut the very subsidies for green energy they once eagerly waved through to help the infant sectors grow. Those subsidies – pioneered by Germany in 2000 to help meeting Europe-wide climate goals enshrined in European Union law – spurred an unsustainable, artificial boom in solar, wind and other renewables, which some analysts say have contributed to financial meltdown on the continent. Similar policies have spread to 50 countries worldwide, including 16 of the 27 EU member states. 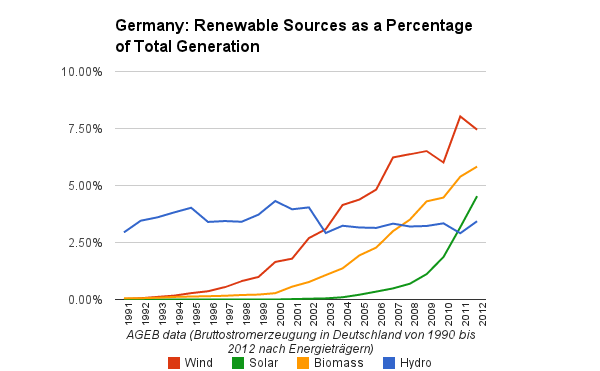 As a result the renewables sector boomed, in particular solar, even in countries such as Germany where a sunny day is far more rare than in Spain. "It's government subsidized electricity prices that have given rise to the current problems in Europe, not renewable energy," said Sebastian Mariz, managing partner at EPPA consultancy firm in Madrid. "[Subsidies] are just one of the external costs which increase this electricity deficit." That has left Europeans struggling to figure out what to do next. In Spain, a country on the brink of economic collapse, the situation is dire: Madrid owes a whopping $35 billion to Spanish utility companies – debt accumulated over a decade of government-regulated electricity prices. Barry Brook, Professor of Climate Science and operator of the Brave New Climate site, contributed Counting the hidden costs of energy to Australian site The Conversation. A recent Bloomberg press release got wide coverage with its claim that wind power is now cheaper than coal. But a new report from the OECD shows that when you cover the full cost to the grid, variable renewables like wind don’t add up as favourably. It is often claimed that introducing variable renewable energy resources such as solar and wind into the electricity network comes with some extra cost penalties, due to “system effects”. These system effects include intermittent electricity access, network congestion, instability, environmental impacts, and security of supply. Now a new report from the OECD titled System Effects of Low-Carbon Electricity Systems gives some hard dollar values for these additional imposts. The OECD work focuses on nuclear power, coal, gas, and renewables such as wind and solar. Their conclusion is that grid-level system costs can have significant impacts on the total cost of delivered electricity for some power-generation technologies. I try to abide by a policy of maintaining my more cold air blog for strictly original content, and this post will primarily quote others ... but it is likely more inspired by my personal experience than most cold air creations. The events surrounding the natural gas generating stations are currently the focus of The Standing Committee on Justice Policy. 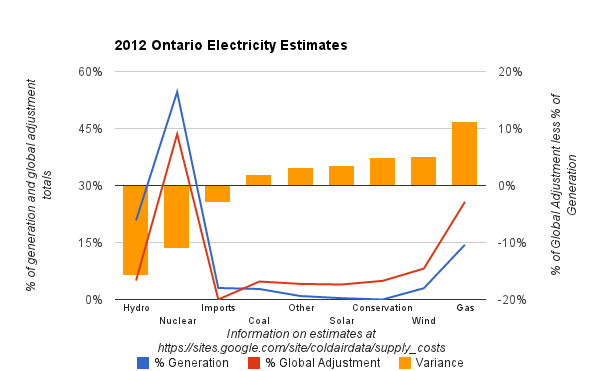 In The High Costs of Ontario's very provincial electricity debacle I provided a brief background, and noted how future costs of the relocated plant would be altered by increasing renewable generation (and different levels of natural gas pricing); in terms of estimating costs today I stated, "the most credible estimate of the cost of relocating the plant is $733 million, as presented by Bruce Sharp." This is the kind of small town lie big town mayors tell - at least where I come from, which happens to be the area involved in the placement of what would become the Oakville Generating Station - when it is built 100's of kilometers east of Oakville. Is it archaic to recite; "reduce, reuse, recycle"
...while cell phone unlocking is absolutely an issue of consumer and digital rights, something important has been ignored in this conversation: unlocking also a green issue. 426,000 cell phones are decommissioned every single day in the United States; many of them will end up banished to junk drawers and rotting in landfills. One billion cell phones are sitting idle in drawers and closets, losing value while they are waiting to be put back into service. Swapping old phones is a common practice; just this week my brother borrowed an old phone from me after his failed. The catch? Swapping only works if you both use the same carrier—an artificial limitation that has created a huge barrier to a sharing economy. Re-legalizing unlocking will keep more devices in service and out of the national waste stream. Texas may be on the way to becoming all hat and no cattle. The already changed climate is rippling through the Texas and national economy. Rising seas have doubled the latest flood zone in the flood maps of New York City, and drought has plunged America's cattle herd to the lowest level since 1952. Beef processing plants are closing, and beef prices are rising. The troubled San Onofre Nuclear Generating Station’s Unit 2 is ready to be operated safely at 100 percent capacity, says plant operator Southern California Edison. The operator says the findings from a recent technical evaluation of the facility bolster its plan to begin operating the reactor at a more conservative 70 percent power for five months. The plant, located near San Diego, has been offline since January 2012, after SCE found unusual wear on new tubes in the steam generating system. It's going to take a little longer to find out if the shuttered San Onofre nuclear power plant in California will be allowed to restart. The Nuclear Regulatory Commission planned to issue a decision as soon as late April on Southern California Edison's plan to bring the Unit 2 reactor back online. The agency's website Tuesday indicates the decision will be delayed until May or June. This is one more contribution to a growing topic that deserves much more attention. Kaiser says this is "a climate-policy disaster" and estimates that this clear-cutting alone will release more than 1,000 metric tons of carbon dioxide into the atmosphere. Forests are important for lowering levels of greenhouse gases, as large quantities of carbon dioxide are trapped in wood -- especially the wood of ancient beech trees like these. Less than two years ago, UNESCO added the "Ancient Beech Forests of Germany" to its list of World Natural Heritage Sites. It wasn't any private forest magnate who cleared these woods out. Rather, it was Hessen-Forst, a forestry company owned by the western German state of Hesse. For some years now, wood has enjoyed a reputation for being an excellent source of energy -- one that is eco-friendly and presumably climate neutral. At the moment, more than half of the lumber felled in Germany makes into way into biomass power plants or wood-pellet heating systems. The result has been an increase in prices for wood and the related profit expectations. The prospect of making a quick buck, Kaiser says, "has led to a downright brutalization of the forestry business." Jordan close to commissioning two nuclear reactors, declines to sign accord with U.S.
ABU DHABI, United Arab Emirates — Jordan is close to commissioning two nuclear reactors, to be built about 100 kilometers south of the Syrian border, as atomic energy spreads through the Arab world, even as uprisings convulse the region. Amman will decide next month which of competing Russian and French-Japanese led consortiums will build two one-gigawatt nuclear reactors near the capital at an estimated cost of 12 billion euros, said Khaled Toukan, chairman of the Jordan Atomic Energy Commission. Bill Gates didn’t mince words last night when sharing with the IHS CERAWeek crowd his thoughts about public support for basic scientific research in the United States. “It’s an incredible travesty that we’re spending so little,” he said. Delivering the final evening keynote for the energy conference in Houston on Thursday, Gates, chairman of Microsoft and co-chair of the Bill & Melinda Gates Foundation, exhorted the energy industry to renew its focus on research and, especially, public support of science. The energy sector, he said, spends too much on projects and too little on research and development. The U.S. energy budget, he said, ought to be doubled, which would mean an additional $8 billion in federal spending. I've been revisiting an old topic for one element of an argument I'm making using Ontario's Global Adjustment. The global adjustment is the mechanism that recovers all supply costs (including capacity payments, feed-in tariff rates, regulated rates, demand/conservation spending, etc) from consumers. In the distant past market rates recovered more than the contracted amount, but recently the Global Adjustment (GA) has been roughly 2/3rd's of the commodity charge, with the market rate recovering only 1/3rd of the cost. The argument I participated in came as certain groups spun reports the nuclear generation was responsible for 45% of the global adjustment into saying nuclear was responsible for increasing electricity costs. The 2012 data with the estimates I regularly generate demonstrates, again, that nuclear contributes much of the GA because it is much of our supply. Obviously if a type of generation produces a greater share of total production than it's share of total cost, it's less expensive than average. 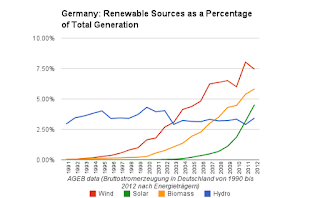 Germany has, since 2000, exempted large power consumers for the EEG surcharge that recovers the cost of feed-in tariff programs (guaranteed rates for renewable generation). More recently similar exemptions have been granted on the grid charges. Two recent posts at the German energy blog indicate the grid charge exemptions are illegal. OLG Düsseldorf also struck down implementing provisions concerning the grid fee exemptions issued by the Federal Network Agency (BNetzA). Five regional and national grid operators had filed legal action against Section 19 para. 2 sent. 2 StromNEV, the provision allowing for the grid fee exemption. BNetzA had defended the provision saying it was covered by law. Besides, energy-intensive companies contributed to grid stability due to their large consumption. I hope the rest of my household doesn't read that large consumption contributes to grid stability! The grid is a major topic, and Jonathan Fahey's article has something for most interested in it. The data background for article comes from an Associated Press comparison of, "reliability statistics with the spending of 210 utilities across 24 categories of local distribution equipment." An Associated Press analysis of utility spending and reliability nationwide found that electric customers are spending 43 percent more than they did in 2002 to build and maintain local electric infrastructure. Since then, power outages have remained infrequent; but when the lights do go out, it now takes longer to get them back on. Neither the spending nor the reliability trends are dramatic on their own. But experts say the combination is revealing: it suggests that the extra money from electric customers isn't being spent wisely—or that utilities aren't investing nearly enough to upgrade fragile equipment that is increasingly threatened by major storms. There is a great set of graphs on the EIA site today that emphasizes a topic that is usually absent in popular discussions on energy. I've been exchanging comments on Twitter initiated by claims, from others, that nuclear generation, not intermittent wind and solar, are the cause of dumping excess production on export markets. It occurred to me that I was about to revisit ground I covered in my very first blog post back in 2010; I updated an old spreadsheet as best I could and recreated a graph from that post, along with one that didn't make it into the blog post. The twitter comment, from Adam Scott at Environmental Defence, was; "Far too much of our power is inflexible, surplus baseload was an issue here in the 90's even before wind." John Spears is reporting that the Ontario Power Authority and renewable proponents have reached an agreement on compensation in instances where supply must be curtailed. Ontario wind power companies have reached an agreement that will curb electricity output from wind turbines when there’s surplus power on the grid. In return, the companies will get compensated for lost output, within certain limits. The agreement puts an end to a dispute before the Ontario Energy Board that pitted the wind companies against provincial power agencies. Retired nuclear industry engineer Donald Jones, P.Eng, reminds us that the United Kingdom had it's own dash for gas a couple of decades ago. It now has soaring prices, declining domestic supply, and worries about the ability to meet demand for electricity in coming years. The present situation in Ontario, and indeed in all of north America, is reminiscent of that in the United Kingdom in the 1990s. Cheap natural gas discovered in the North Sea together with the fortuitous development of combined cycle gas turbine (CCGT) generating stations effectively put a stop to any future nuclear build. The “Dash for Gas” had started. The last nuclear plant to be built in the UK was Sizewell B, a Westinghouse design, that started up in 1995 but planned follow-on units were cancelled because of the availability of low cost gas. However in North America, well at least in the USA, nuclear has not been stopped, just slowed. Today the situation in the UK is much different. North Sea reserves of natgas are down and gas prices are very much up. In 2010 the UK grid was made up of 34,000 MW of gas (Ontario 10,000 MW), 29,000 MW of coal (Ontario 3,300 MW), 11,000 MW of nuclear (Ontario 13,000 MW), 4,200 MW of hydro (Ontario 8,000 MW) and 4,200 nameplate MW of wind (Ontario 1,500 MW). Imported gas will account for 75 percent of all gas consumed in UK by 2015, it was 50 percent in 2009. The government has set a limit on carbon emissions from fossil plants that ensures that only gas-fired units get built in the future, unless carbon capture and storage (CCS) becomes practical for coal-fired plants – unlikely. Ian Macleod covers a number of issues regarding Atomic Energy of Canada Ltd in this column, including medical isotope production, waste disposal, and ownership/management structure. “We are not selling or closing the Chalk River nuclear laboratories,” Oliver told several hundred delegates representing Canada’s nuclear establishment. Under an arrangement known as a government-owned, contractor-operated, or GoCo, “the new model aims to bring private-sector rigour and efficiencies to the management of the laboratories and the goal of creating commercial opportunities and reducing the financial costs and risk for Canadian taxpayers,” he said.